Summer has come early to Vancouver and I couldn’t be happier! I’ve said it many times before…I’m a summer girl! Summer signifies barbecues and picnics. Not only am I a summer girl, but I’m a salad girl too! But packing salads for picnics can be challenging…how to transport the dressing without it going bad or leaking all over the other food? How to serve it? How to keep it from going soggy? Well, I came across the most brilliant Istapost and I’ve tried it and it’s a definite a winner! No recipe here…just wing it! 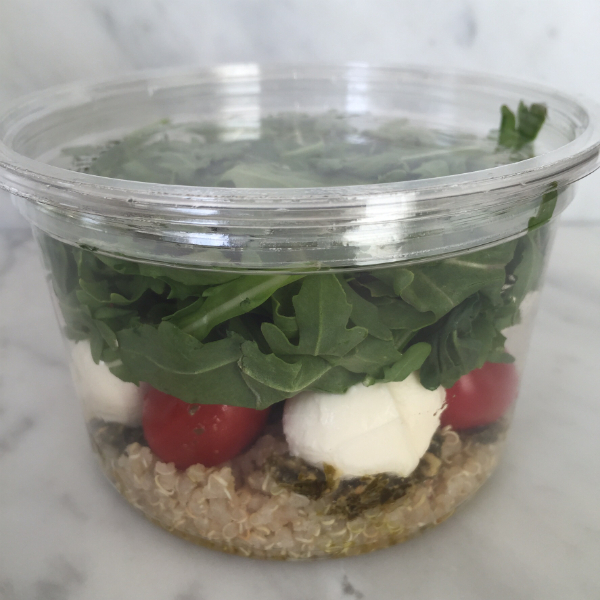 You can use individual jars or I used BARE Solo disposable bowls with lids (you can purchase them locally at HY Louie…handy for acai bowls too). They are 100% recyclable and they are made out of 20% recycled materials…and you don’t have to bring them home with you! 1. Cook up some quinoa in chicken broth according to package instructions and let cool. The broth just gives it more flavor. 2. 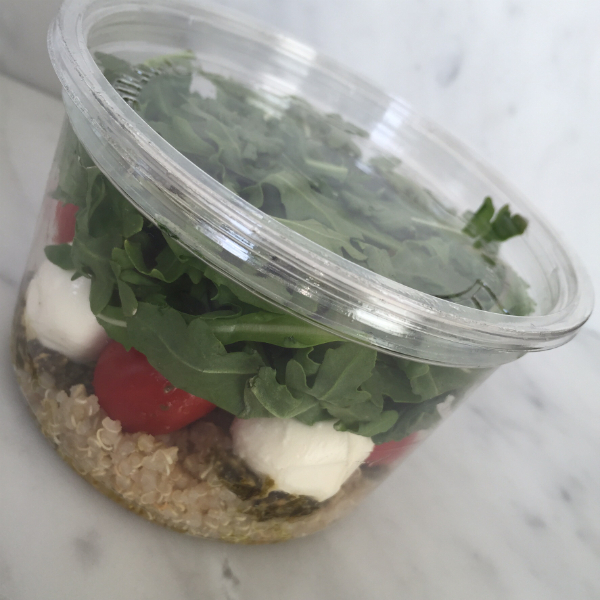 Once cooled, spoon a layer of quinoa into your jar or bowl. 3. Drizzle with some good quality olive oil. 4. Add some bocconcini…fresh mozzarella. You can use cocktail size whole or buy the larger size and use slices. 5. Add a few cherry tomatoes. It really adds some color to have a few red and yellow ones. But all red will taste just as yummy! 6. Spoon a bit of pesto on. 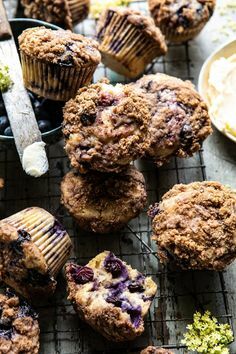 You can make your own, but I just used store-bought and it was delicious! 7. Top with baby arugula. 8. Cover and pack it up! The girls have taken this to dance for dinner a few times and they love it. You can mix it all together. 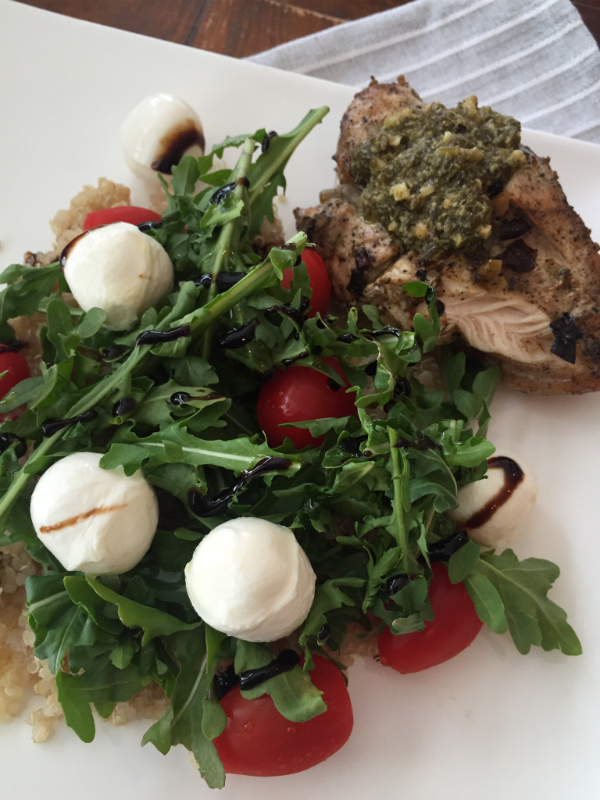 You have built in dressing with the olive oil and pesto, protein with the bocconcini. And the arugula is hearty so it doesn’t wilt. This makes a great salad to bring to barbecues as well. Make thin layers on a large platter. And for dinner, just add a grilled chicken breast! 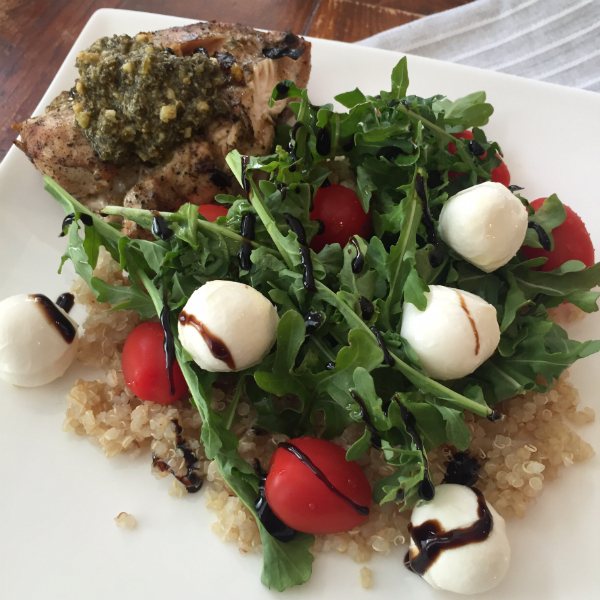 Add a drizzle of balsamic cream and you’ll look downright fancy! This just goes to show that great food doesn’t have to take a ton of time. A couple of fresh ingredients and you are set!